The kids and I just got back from a long weekend in Pigeon Forge, Tennessee. (Thanks to Pigeon Forge for hosting our stay and activities! We were required to share our experience, but all opinions are my own. 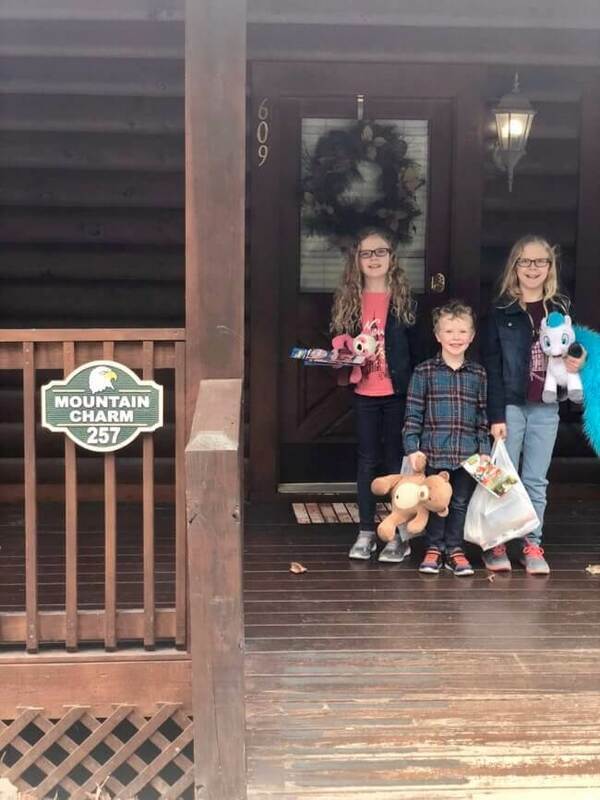 With a little input from my equally opinionated kids, of course…) It had been a while since we spent much time in the Smoky Mountains, so none of the kids even remembered going previously. 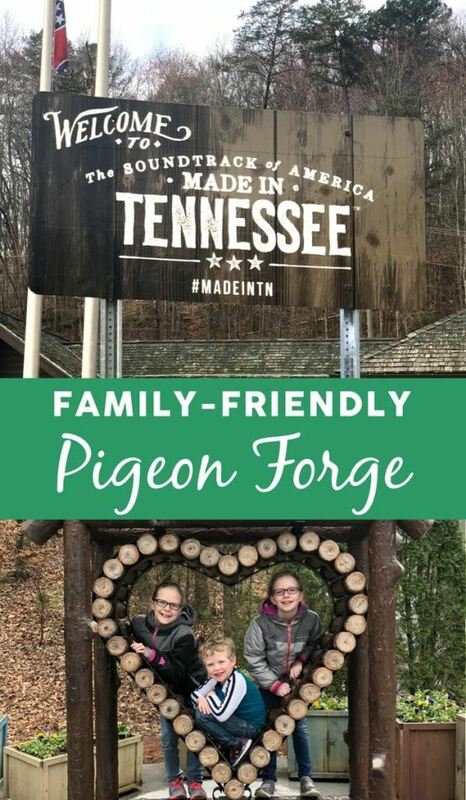 Having grown up visiting the area almost every year, I wondered if we’d find enough to do in Pigeon Forge that was new for me, too. Wow, was I pleasantly surprised! All settled into our beautiful cabin, part of the Eagles Ridge Resort! During our 4-day trip, we got to experience so many new things – including unexpectedly checking an item off my bucket list! 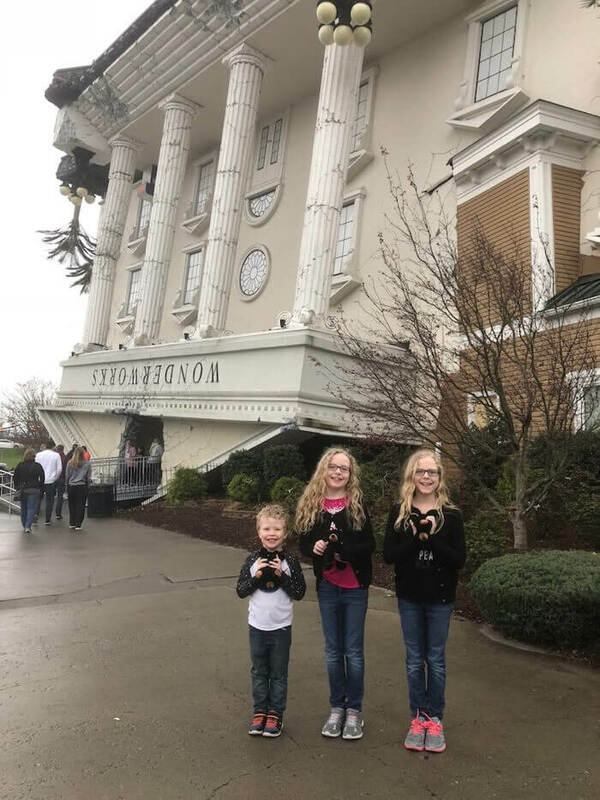 We could have spent several more days there, and still not experienced it all… and we didn’t even leave the Pigeon Forge area to spend any time in Gatlinburg or Sevierville. The Smoky Mountains are a great place to celebrate family. As a child, my family would spend a week or two in Pigeon Forge and Gatlinburg almost every year. We split our time between the more “touristy” things and outdoor adventure activities. 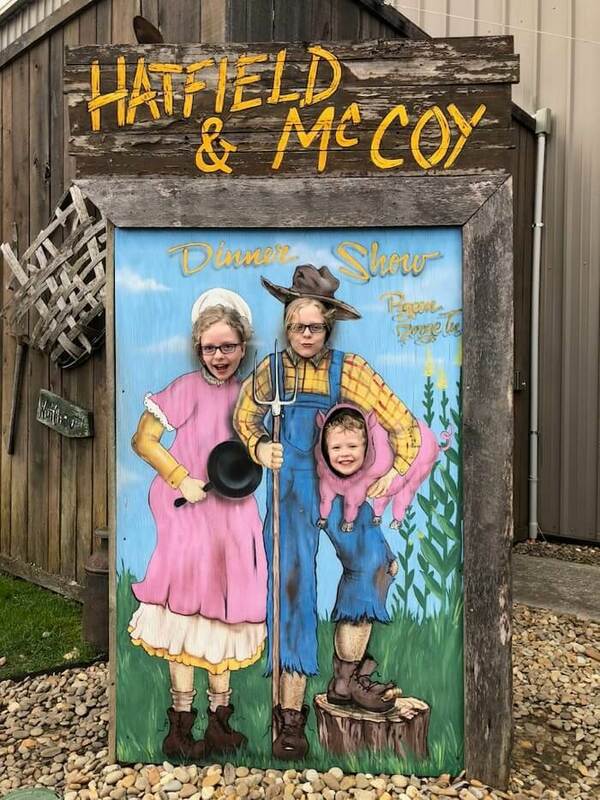 My husband and I stopped there for a couple of nights on the way to our honeymoon; we’ve taken our kids a handful of times, though apparently not recently enough! On each of those trips (usually much shorter than my childhood visits), we spent more time outside than at indoor attractions. It had been many years since I experienced some of the kinds of things available for families in the Smoky Mountain area. There are dinner shows of all sorts in Pigeon Forge, including the fun and farcical “Hatfield and McCoy Dinner Feud”. Whether you’re looking for something that is endearingly cheesy or powerfully sentimental, you’ll find it. We saw two dinner shows back to back and enjoyed both – for extremely different reasons. The Hatfield & McCoy Dinner Feud Show is described as “farcical”, which is pretty accurate. It’s very silly at times, but also includes some incredible dancing and an entirely surprising stunt scene. There’s a sweet twist too, which made the entire story a hit with our family. The following night we saw Dolly Parton’s Smoky Mountain Adventures. This dinner show (with the best food I’ve had at any all-you-can-eat show like this!) tells the story of Dolly’s parents, and the beginning of her time in the special place she calls home. It’s filled with beautiful artistry and a sweet, romantic story. There are a number of great ropes courses and ziplines in Pigeon Forge, including this one at The Island. 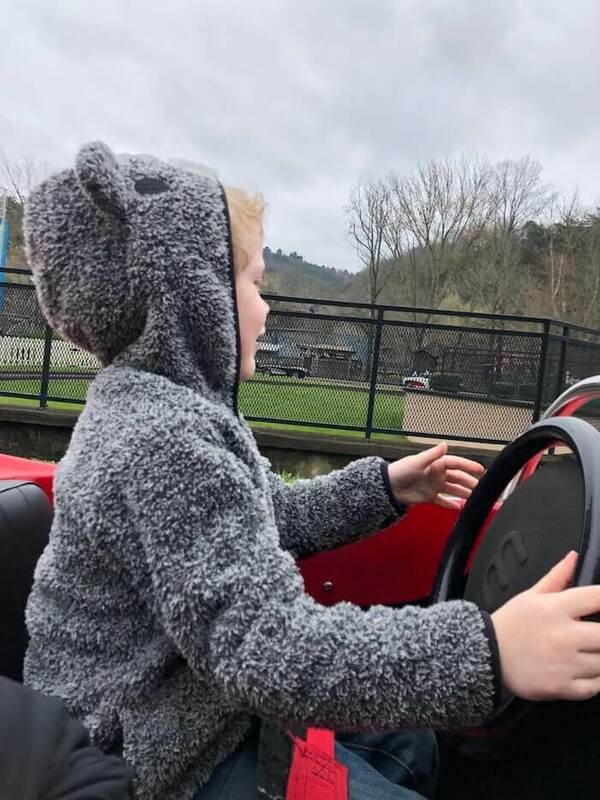 Some of our friends go to the Smokies relatively frequently, and they always come back with stories from their favorite Go Kart tracks. This visit, we spent time at The Track (located right on the Parkway in Pigeon Forge). The Track has three different track layouts: one for families, one for bigger kids and grown-ups, and one for the littlest drivers. Guests purchase a card with any number of “credits”, which are used for turns on any of the kart tracks, or any of the other rides. We only drove karts, but The Track also has bumper cars, bumper boats, an arcade, and a number of kids midway type rides. You’ll also find plenty of thrills – and plenty of kid- and family-friendly rides – at Dollywood. We spent the entire day at this popular theme park and had a blast. 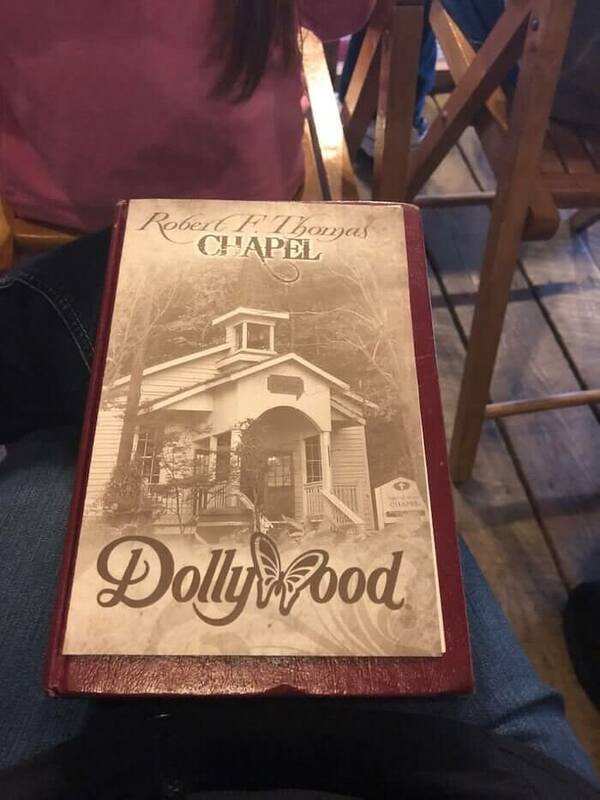 It had been nearly 20 years since I went to Dollywood, and I didn’t know exactly what to expect. There were so many fun attractions our whole family could ride together, but for my oldest two kids and I, the stars of the show were the roller coasters. If you make it to Dollywood and are looking for a thrill, be sure to ride the Lightning Rod! It’s the fastest wooden coaster in the world, but we loved the hill launch and the super fun track layout even more than the speed. My 5-year-old found plenty of thrills too, and highly recommends the Firechaser Express family coaster. 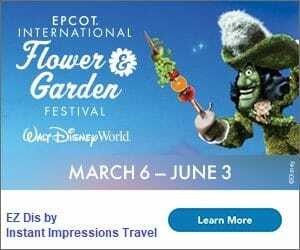 Even before we began homeschooling, we were big fans of travel opportunities that also provided fun learning experiences; I blame the value Disney Parks’ Imagineering places on “edutainment”! Pigeon Forge has plenty of opportunities for learning through play. We spent some time in Wonderworks, most frequently referred to by my children as simply, “the upside down building”. Similar to other museums of science and industry, we played and learned through interactive exhibits on weather, pressure, physics, and so much more. 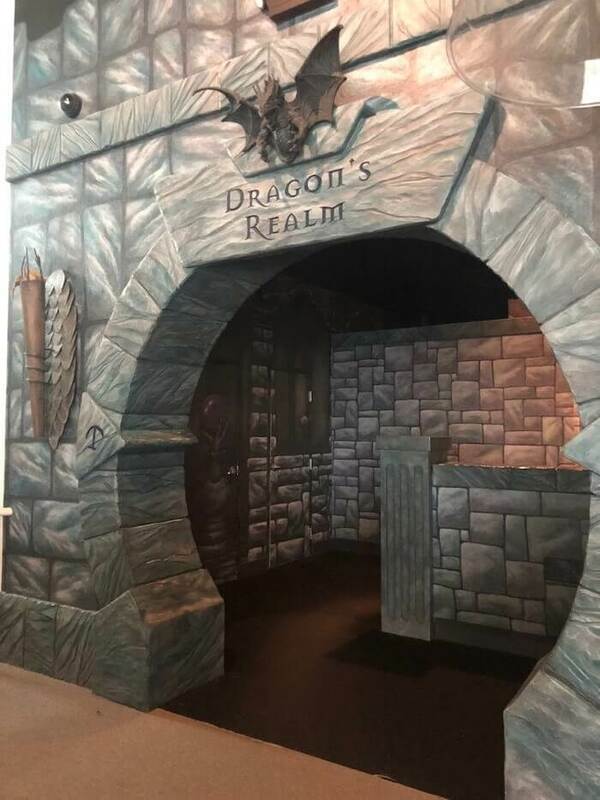 The MagiQuest location in Pigeon Forge is made up of several immersive, themed rooms… and lots of fun adventures! Somewhat less “educational” but something that stretches the mind nonetheless, we also were extremely impressed with the standalone MagiQuest location. We had played MagiQuest previously at Great Wolf Lodge, but the dedicated location in Pigeon Forge was so much more immersive, well-themed, and extensive. We only got to play an hour on our quest, but could tell it will be a great place to work out clues and work together as a team, the next time we’re in Tennessee. 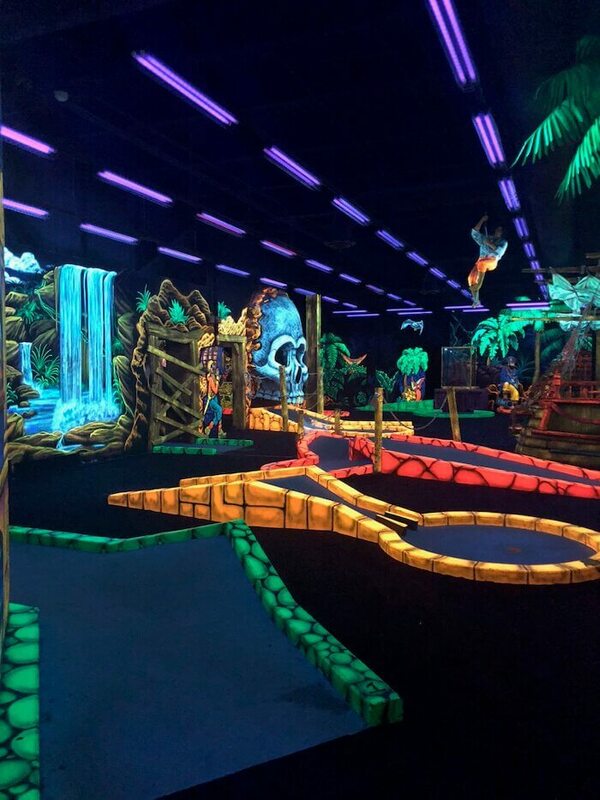 A fun blacklight mini golf course is just one of the extras included in most MagiQuest admissions. Tip: Be sure to plan for a significant amount of time if you visit MagiQuest! Included in most admission, in addition to the Adventure/Quest for which the attraction is named, you can also play a fun indoor mini-golf course and experience a truly baffling mirror maze. You might also want to purchase additional time for the quest itself, as the regular admission allows only one hour – at which point the interactive portion will no longer work. For what I think is my first time ever, I visited the Smoky Mountains and returned home without so much as setting foot in a park or on a hiking trail. The Smokies have scenic options for absolutely everyone, from paved walking trails (and even driving routes if you’d rather stay in your vehicle!) to stretches of the famed Appalachian Trail; no matter how outdoorsy (or “indoorsy”!) you may be, the Great Smoky Mountain National Park is definitely worth checking out on your visit. Most of the hiking will begin in nearby Gatlinburg, but there are plenty of chances to be outside in Pigeon Forge, too! 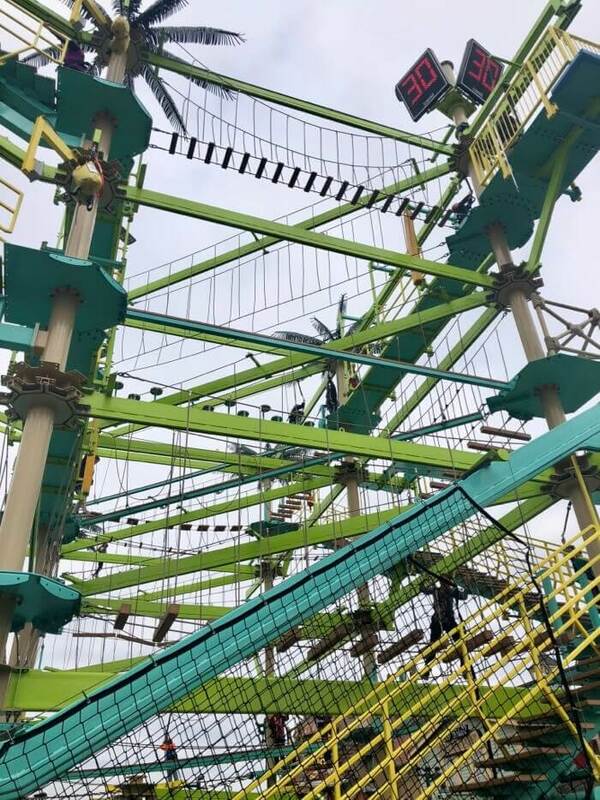 When we go back, we’re definitely going to check out one of the zip lining attractions, and the white water rafting adventures. There are also numerous opportunities for horseback riding, ATV trail riding, and a relatively new Alpine Coaster that reminds me of the Ober Gatlinburg Alpine Slide – a perennial family favorite when I visited with my parents. I was so excited to check Zorbing off of my bucket list! The coolest outdoor activity we got to experience on this visit though, was at the Outdoor Gravity Park. We were trying to find something to do to fill about an hour before a dinner show reservation, when I noticed Outdoor Gravity Park specializing in something I’ve been waiting to do since I saw it emerge in New Zealand several years ago. 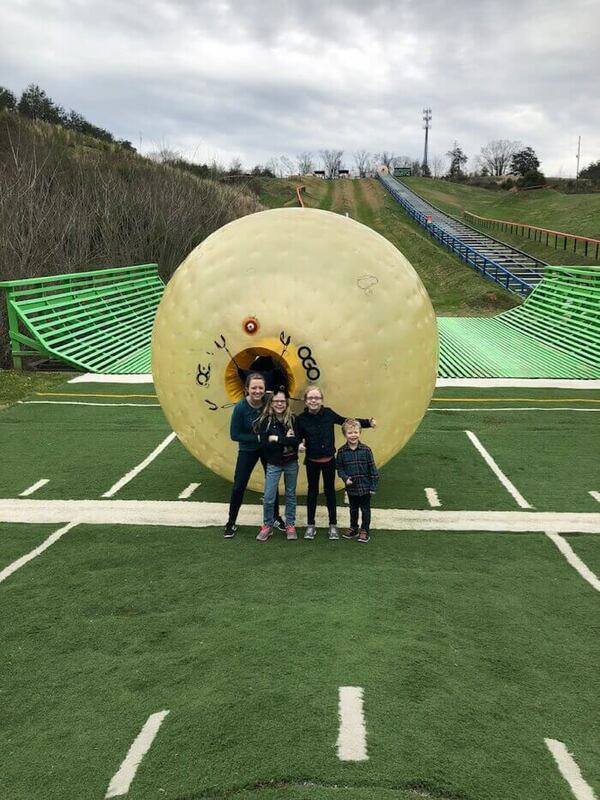 You guys, my kids and I got to go Zorbing! Not sure what it is? Check out their site here, but I’ll give you a quick visual: it’s much like rolling down a hill in a hamster ball. And it’s an absolute blast. 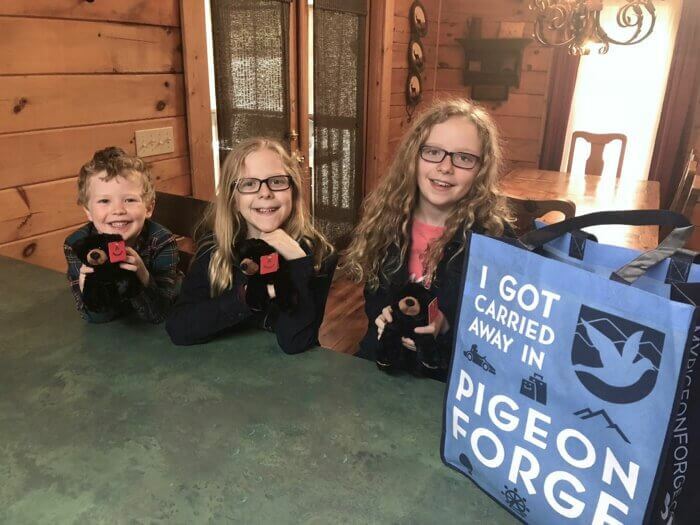 If you’ve spent much time in the south, and especially in the Pigeon Forge area, you know that faith and family are often part of the appeal. There is perhaps nowhere else in the country – at least not that I’ve experienced – where a roller coaster has one of my favorite Bible verses painted on a mural in the queue and where you can sing in the choir during the Palm Sunday chapel service in the middle of a theme park. 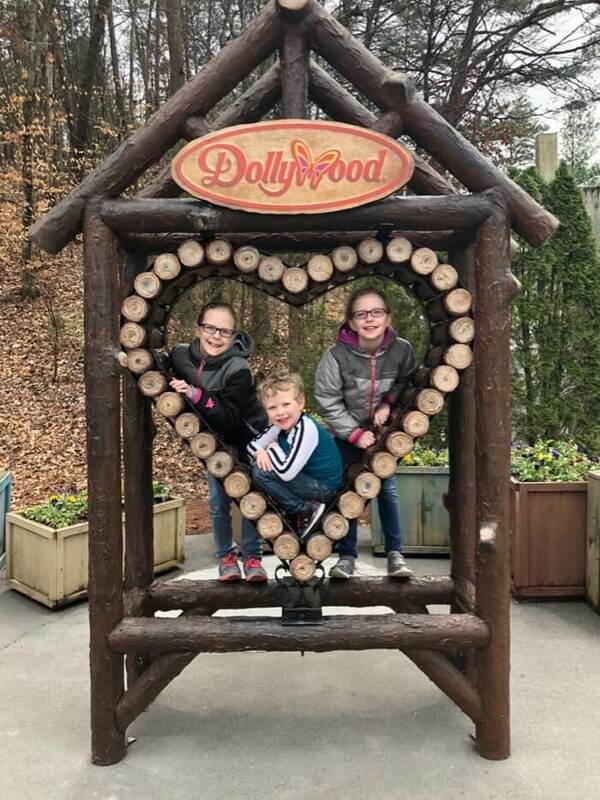 It’s not just Dollywood either; there is such an emphasis on togetherness and quality time that I think any family could make extra special memories there. My daughter and I got to sing in the Palm Sunday choir inside a Dollywood chapel! Such a unique experience. There are plenty of hotels and motels in Pigeon Forge. Most of the lodging that falls right along the Parkway are traditional lodging options like this. You’ll even find themed hotels like the Christmas Inn and the Margaritaville Island hotel. On most of my trips growing up, we would rent a chalet or cabin. These accommodations tend to be slightly off the parkway – though still surprisingly close. Our 3-bedroom, 2-level cabin within the Eagles Ridge Resort was just a couple of blocks away from the action; we were able to leave our lodging and be right in the middle of the attractions on the parkway in less than five minutes. Renting a cabin is an awesome option for families, and our usual go-to in the Smokies. Part of the appeal of a Smoky Mountain vacation is relaxation – if you can pull yourselves away from the fun, of course. Cabins allow you to spread out, make your own meals, sit in a rocking chair on the front porch, or relax in the hot tub after a busy day. Obviously the details may vary between cabin rental companies (and even from property to property), but most of them have a similar set of amenities. Some companies like the Eagles Ridge Resort even have community clubhouses and swimming pools (seasonally) for all guests to enjoy. In the meantime, start brainstorming for your visit here – and pin this for your planning!